Guduchi (Tinospora cordifolia) complete detail. 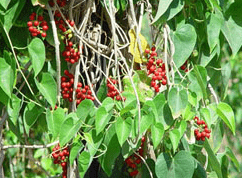 Description and medicinal uses of Guduchi – Tinospora cordifolia. Classification of Guduchi (Tinospora cordifolia). Guduchi is a traditional ayurvedic medicine. 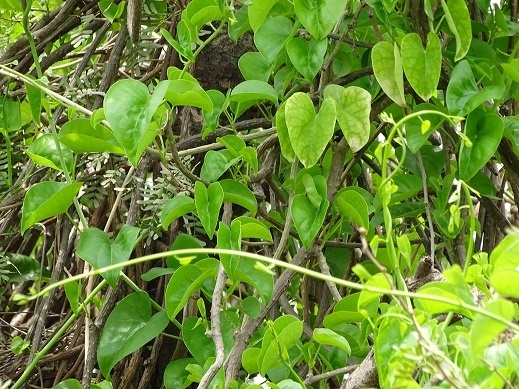 Habit and habitat of Guduchi (Tinospora cordifolia). Guduchi considered as one of the most divine herb. Guduchi is a large, deciduous extensively spreading climbing shrub with several elongated twining branches. Branches are long, bear smooth and dirty white or light greyish brown in color. Flowers can be seen in June, while fruits occur in November. Fruits are drupes, turning red when ripe. Fruits aggregate of 1-3, ovoid smooth drupelets on thick stalk with sub terminal style scars, scarlet or…………………. 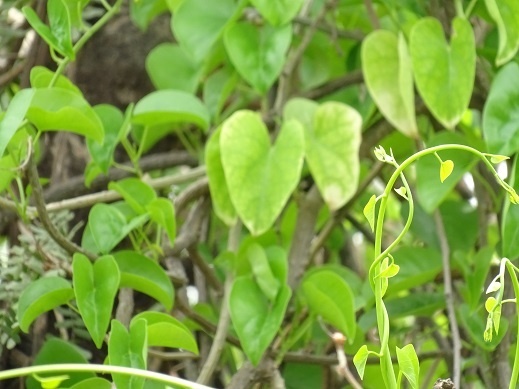 Leaves are simple, alternate, heart shaped, 10-20 cm long or 8- 15 cm broad, and dark bright green in color. Flowers are unisexual, small, and greenish yellow on axillary and terminal racemes. Male flowers clustered, female usually solitary. Sepals 6, free in two series of three each. Petals 6 free smaller than sepals, obovate and membranous…………. The decoction of guduchi and sunthi is a good combination for treating gout and rheumatic disorders. The root of guduchi is a strong emetic and used used for bowel obstruction. The starch of the plant serves as a household remedy for chronic fever relieves burning sensation and increases energy and appetite. 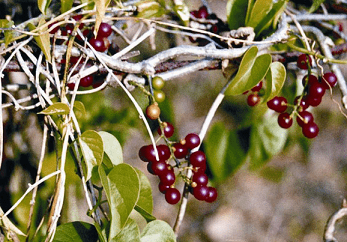 Guduchi is a large, deciduous extensively spreading climbing shrub with several elongated twining branches. 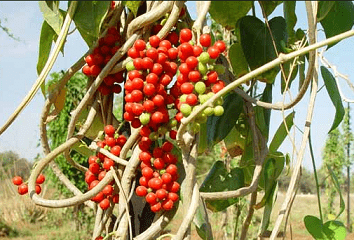 Guduchi also known as glabrous climbing shrub and herbaceous vine. Bark is succulent, with deep clefts spotted and large rosette-like lenticels. The color of bark is creamy white or grey. Long thread-like aerial roots arise from the branches. Branches are long, bear smooth and dirty white or light greyish brown in color. Leaves are simple, alternate, heart shaped, 10-20 cm long or 8- 15 cm broad, and dark bright green in color. Flowers are unisexual, small, and greenish yellow on axillary and terminal racemes. Male flowers clustered, female usually solitary. Sepals 6, free in two series of three each. Petals 6 free smaller than sepals, obovate and membranous. Flowers can be seen in June, while fruits occur in November. Fruits are drupes, turning red when ripe. Fruits aggregate of 1-3, ovoid smooth drupelets on thick stalk with sub terminal style scars, scarlet or orange colored. The fruit is pea-sized. Guduchi found in India, Myanmar and Sri Lanka. Guduchi is distributed throughout the tropical region of India up to 1,200 m above sea level. They prefer deciduous and dry forests. It thrives easily in tropical regions, often growing to great heights, and growing over hedges and small trees. The wood is white, soft, and porous, and when freshly cut, quickly assumes a yellow tint. Guduchi considered as one of the most divine herb. Guduchi has many medicinal properties like antibiotic, immunosuppressant, anticancer, anti-spasmodic, anti-microbial, anti-osteoporotic, anti-inflammatory, anti-arthritic, anti-allergic, anti-diabetic, Anti-toxic, Anti-HIV, antineoplastic, anti-oxidant, hypolipidemic, immunologic, anti-periodic, anti-stress, Immunomodulatory etc. A variety of active components like alkaloids, steroids, diterpenoid lactones, aliphatics, and glycosides, have been isolated from the different parts of the plant body, including root, stem, and whole plant. 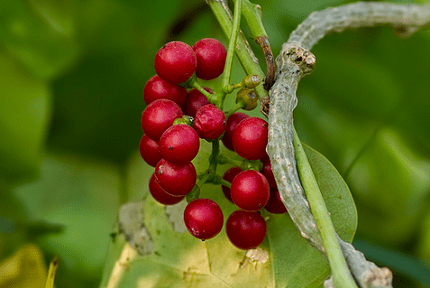 Guduchi is a traditional ayurvedic medicine, and used in the treatment of fever, jaundice, diabetes, chronic diarrhea, urinary disorders, cancer, dysentery, bone fracture, pain, asthma, skin disease, poisonous insect, snake bite, and eye disorders. A decoction of the leaves is used for the treatment of gout. It is also considered good for the brain. Guduchi is also useful in the treatment of heart diseases, leprosy, helmenthiasis and rheumatoid arthritis. Guduchi is used to support the immune system and the body’s resistance to infections. Guduchi supports normal white blood cell structure, function and levels. It is helpful in treating digestive ailments such as hyperacidity, colitis, worm infestations, loss of appetite, abdominal pain, excessive thirst, and vomiting and even liver disorders like hepatitis. The starch of the plant serves as a household remedy for chronic fever, relieves burning sensation and increases energy and appetite. The decoction of guduchi and sunthi is a good combination for treating gout and rheumatic disorders. The root of guduchi is a strong emetic and used for bowel obstruction.